In Ropemakers for the Navy: Part I we discussed the methods for making rope and the creation of the only U.S. Navy ropewalk, built at the Charlestown Navy Yard in the mid-1830s. As the 19th century progressed, a different natural fiber was introduced into the American cordage industry. In the 1880s, the United States began importing less expensive “Manila hemp.” Named for the port in the Philippines where the plants were shipped from, Manila hemp (or just “Manila”, as it came to be known), is the abaca plant. The long, silky fiber that is stripped from the plant’s stalk provides natural rope making material. As a cost-saving measure, Manila was used in addition to American-grown hemp in the Charlestown Navy Yard ropewalk. The ropewalk entered a new era of modernization at the dawn of the 20th century. Electric lighting was installed in 1895 and fire sprinkler equipment was installed between 1899 and 1900. In 1908, the second story of the ropewalk, where the spinning equipment was stationed, was extended. By 1919, a woman’s restroom was added as a result of World War I and the employment of women at the ropewalk. In June, 1927, USS Constitution entered Dry Dock 1 in the Charlestown Navy Yard for what would become a massive, four-year, nearly $1 million restoration. As part of “renewing” (i.e. replacing) 85 percent of the ship’s structures, Constitution also received a whole new sailing rig including masts, yards, and a suit of cotton canvas sails. A sailing frigate the size of “Old Ironsides” required approximately 40 miles of cordage of varying diameters. The cordage became the standing rigging to support the masts and the many lines needed for the running rigging used to manipulate the sails. All of Constitution‘s rigging for the 1927-1931 restoration was made at the Charlestown Navy Yard ropewalk. 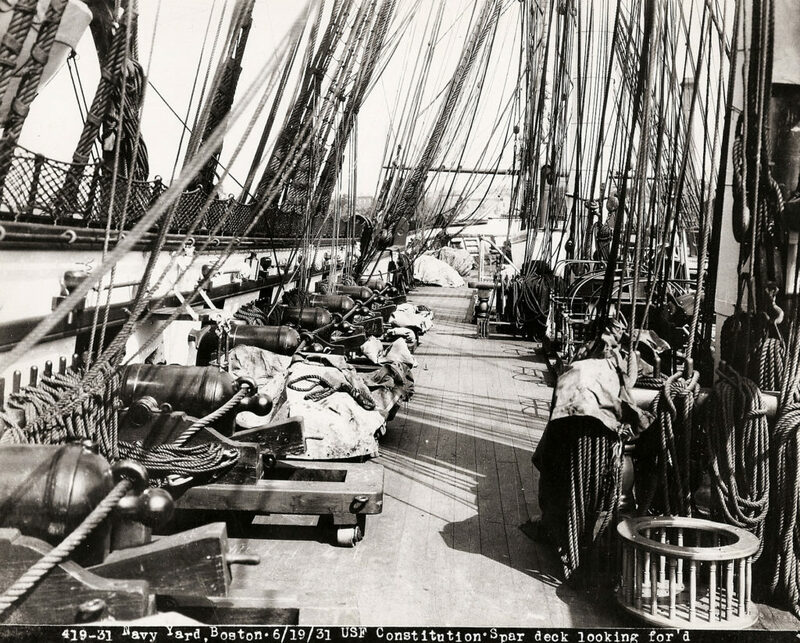 According to plan #50670, “Lengths and Weights of Hemp Rope for Rigging, Cables and Sails” (shown below), only hemp was used for the standing and running rigging, bolt ropes for the sails, cables, and other miscellaneous small lines. “Plan #50670, U.S. Frigate Constitution Lengths and Weights of Hemp Rope for Rigging, Cables and Sails, Navy Yard Boston, April 5, 1929.” About 67 tons of rope was manufactured at the Boston Navy Yard, for standing and running rigging, bolt ropes for sails, block straps, etc. [Courtesy Naval History & Heritage Command Detachment Boston]. The photograph below, taken in mid-June of 1931 as the re-rigging of Constitution was being completed, shows the web-like appearance of a nearly fully rigged sailing ship. Note the various tarpaulins draped over the carronades along the port side of the deck. The tarps were likely used to cover the guns so that the freshly tarred standing rigging would not drip onto the guns and their carriages. The circular basket-like object in the lower right of the photograph is a bin into which the sheet lines of the large topsails overhead were neatly coiled. As the United States entered World War II, the Charlestown Navy Yard workforce, including that of the ropewalk, expanded to meet the wartime demands. Every U.S. Navy battleship required 34,000 feet of cordage, a difficult challenge as ropemaking materials were becoming harder to import during the war. Homegrown resources were tapped to supply the enormous amount of rope needed for the Navy. 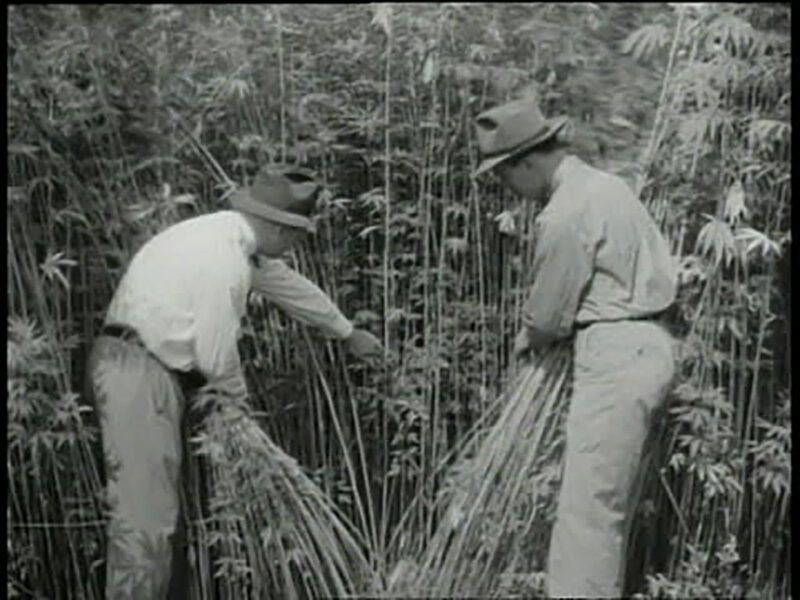 To encourage hemp production, the U.S. Department of Agriculture released in 1942 a short film titled Hemp for Victory. The film explained the uses for hemp and encouraged agricultural workers to grow as much as possible to aid in the war effort. Screenshot from Hemp for Victory (1942). The film was produced by the U.S. Department of Agriculture to encourage farmers to grow hemp for industrial wartime use. In the Hemp for Victory film, produced by the U.S. Department of Agriculture and directed by Raymond Evans, hemp cultivation is featured along with the ropewalk at the Charlestown Navy Yard (the ropewalk is mentioned at 11 minutes 25 seconds). Hemp, from the genus cannabis, can grow up to 16 feet in height and has been cultivated for nearly three millennia. The strong, durable fiber used to make cordage is located in the stalk of the plant. Cannabis is the general term applied to several cannabis plants of which some, such as Marijuana, are known for their hallucinogenic effects. Hemp and cannabis (Marijuana) are cousins and contemporary slang often conflates the two. The ropewalk was finally closed in December 1971. Since the 1927 restoration, USS Constitution had carried Charlestown Navy Yard hemp rigging. In her 1973-1975 restoration, though, the ship received her first set of synthetic rigging, polypropylene, not manufactured by the Yard’s ropewalk. Captain Raymond W. Burke, Commandant of the Boston Naval Shipyard, and Edmund B. Skelly, general foreman of the yard’s historic ropewalk, inspect the last coil of rope to be produced at the ropewalk complex in the Charlestown Navy Yard in Boston. December 17, 1971. [Courtesy of Boston Globe]. In the few years before the ropewalk shutdown, a portion of the laying ground, where the lengths of rope were created, was set up as a ropewalk exhibit. With the exception of the ropemaking equipment in the exhibit, the rest was declared surplus by the U.S. Navy and sold to another Massachusetts ropemaking facility. Any equipment left in the ropewalk in 1974, when the Charlestown Navy Yard closed, was transferred to the National Park Service. After 175 years of serving the U.S. Navy, the Charlestown Navy Yard closed in 1974. Thirty acres of the 150-acre Yard became part of the Boston National Historic Park maintained by the National Park Service. At first, the ropewalk was not a part of the 30 acres included for preservation and its future was uncertain. However, between the late 1970s and early 1980s, preservation, stewardship, and oversight guidelines for the ropewalk complex were established between the Boston Redevelopment Authority, the National Park Service, the Massachusetts State Preservation Officer, and the Boston Landmarks Commission. During these major transitions, from the 1970s to today, the ropewalk structure has aged, but it has, in general, maintained most of its structural integrity. When viewed from the main entrance, the Charlestown Navy Yard ropewalk has remained largely unchanged since its first known illustration in 1852. The future looks bright for the ropewalk. In May 2016, The Boston Globe featured an article about developer Joe Timilty and his plans to redevelop the ropewalk into high end housing. As an historic building, there are specific conditions imposed by the National Park Service and the Massachusetts Historical Commission that must be incorporated into the design. The redeveloped ropewalk building will feature a ropemaking museum at one end, a stone walkway restored along the exterior, and a painted mural depicting the ropewalk and the Navy Yard. Timilty, along with the National Park Service, Boston Redevelopment Authority (now renamed the Boston Planning & Development Agency) and the Charlestown Neighborhood Council, will work together to recreate the ropewalk for the 21st century. The National Park Service, stewards of the Charlestown Navy Yard, preserves the history of the ropewalk in an interactive exhibit in their Visitor Center, located in Building 5 in the Yard. The exhibit explores the ropewalk’s history, including examples of the machinery, rope, and an explanation of ropemaking techniques.